The Fae-bot is a suspended robot, using 4 cables and 4 winches in its standard configuration. By rolling and unrolling the cables in a calculated fashion, the central platform can be moved in a big 3D volume. A control module is responsible to control and synchronize the winches. On the suspended platform is a tool, in the standard configuration it is a claw which is powered by a battery and activated through wifi. The user accesses both the control module and the claw module through a web interface served on a local wifi network. Inside the control module, a Raspberry Pi hosts a webserver. The client typically connects to this server in order to control the Fae-Bot. This raspberry pi is connected through USB to an Arduino that will send pulses to the winches. The winches are activated by a stepper motor that is controlled by a motor driver of the TB6600 family. It receives two signals: a DIR that indicates the direction and a PUL that receives pulses when the motor should move one step. The driver then transforms these impulses into a power signal sent to the servo motor coils. The logic of the Fae-Bot uses 5V, while the motors and the motor drivers are rated to use 24V to 30V. The control module is powered through a USB micro B connector. It powers the Raspberry Pi which in turn powers the Arduino through its USB connection. Be sure to plug a charger able to feed 2.4A to the devices. The central platform is battery powered and uses a classic USB battery. Similarly, it powers the Raspberry Pi that then powers the Arduino through a USB. The Fae-bot is controllable through a web browser from any device connected to the fae-bot’s wifi network. The Raspberry Pi of the control module serves a webpage on http://192.168.11.5:5000 that renders as a control GUI. Its buttons trigger HTTP requests that the server then translates as orders to send through serial to the Arduino nd translates claw orders as requests to http://192.168.11.100:5001 where the second Raspberry Pi also listens with a webserver . Both servers are written in python using the Flask framework. [POST] /stop Immediately stops any motor movement. [POST] /set_target/ Sets the current position as target number #id. Possible IDs are 0, 1, 2 and 3. Switch on the battery in the clamp module. 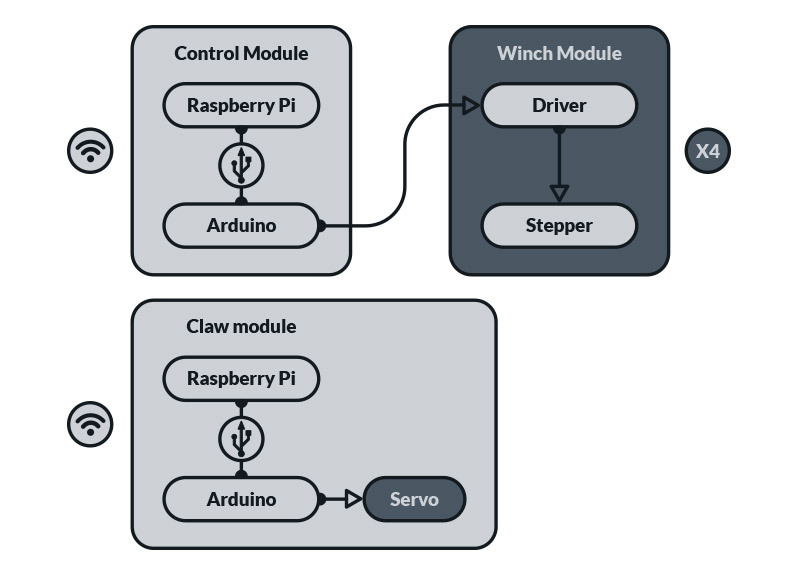 The claw module reproduces this mechanism, except that the respective Raspberry Pi does not serve a webpage, but rather waits from HTTP requests from the main page (see the Software section for details). The The Fae-bot is controllable through a web browser from any device connected to the fae-bot’s wifi network. The Raspberry Pi of the control module serves a webpage on http://192.168.11.5:5000 that renders as a control GUI. 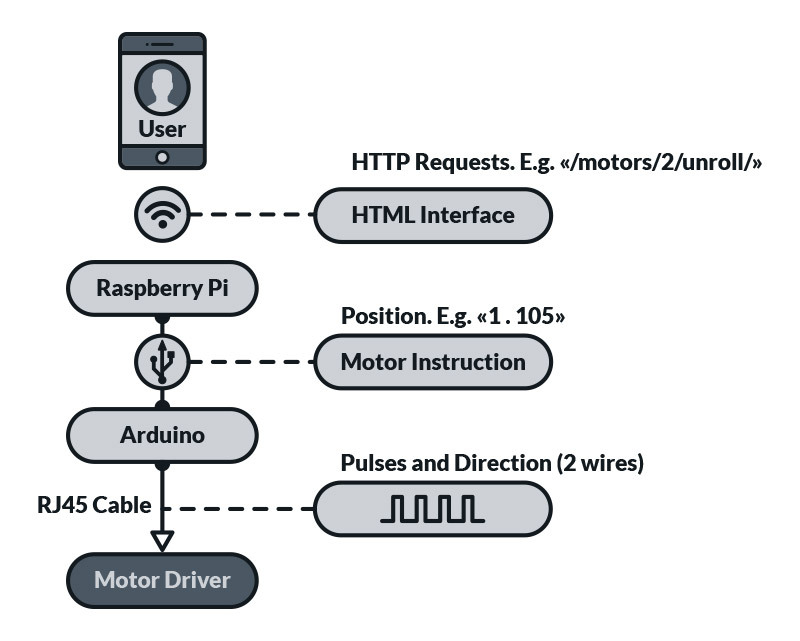 Its buttons trigger HTTP requests that the server then translates as orders to send through serial to the Arduino nd translates claw orders as requests to http://192.168.11.100:5001 where the second Raspberry Pi also listens with a webserver .